With a female owner and manager, the store caters for the growing number of women runners by stocking essentials such as proper sports bras. They assist customers who might not be able to afford high-end products by offering a three month lay-by option for purchases over R900. This helps consumers buy the right products for their running needs. They are able to accept specialist or- ders for stock that they might not carry, by ordering them for their customers. As runners, they know how to assist and advise fellow athletes with selecting the shoes that will be best suited to their gait and pronation, in order to prevent injuries. Busi Mqingwana recently celebrated the opening of her running specialist store, The Runner’s Store, which is an extension of her love for running. "Ifell in love with road running after seeing the positive effect it had on me from a health perspective,” says Mqingwana, who has been a runner for six years, during which time she also completed the Soweto Marathon. With stylish hanging lights, a leather couched seating area and wood panelled shoe display area, The Runner’s Store does not have your typical store look. “Since the store is new in the market, I decided that it needed to set a good first impression to prospective customers, hence the choice to go big or go home,” she says. 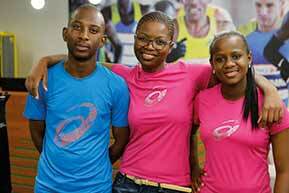 Because of her familiarity with the area, Mqingwana decided to open The Runner’s Store in the Pretoria CBD. She has been living in Pretoria for eleven years, more than half of which she has been a road runner in the area. During her time as a runner she noticed the big runner interest in the area and saw the gap for a running specialist store. The dream of The Runner’s Store was born on the streets of Pretoria, and therefore it is fitting that the dream should sprout its roots there too. Pretoria’s latest running specialist store owner comes from a long legal background. She has spent the past seven years practicing law (two as a candidate attorney and five as an admitted attorney). Prior to opening The Runner’s Store, Mqingwana was a senior legal advisor with the South African Bureau of Standards for almost three years and she worked for three years as an associate at Gildenhuys Malatji Incorporated. But her heart lay on the running paths and she “decided to earn a living from what [she] loves most — road running”. In an industry dominated by male store owners and managers, it is refreshing to see a woman’s approach to running a running specialist store. “I have had practical training [for opening the store] from the moment I took on road running six years ago — including sustaining injuries such as shin splints due to running with the incorrect shoes and also over-training,” says Mqingwana. 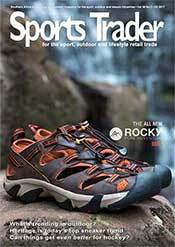 The store currently focuses on providing products and service for all levels of road runners, from novice to veteran. They aim to help runners to concentrate on improving their performance, without having to be concerned about where to find the right gear. As the store grows — and if there is a demand — they may branch out to include trail running, she says. The store caters for both men and women. From the experience gained by Mqingwana during her running years, they know how important the right support is for ladies and therefore also stock items such as sports bras.